The universal genetic code is made up of several codons or triplet bases. 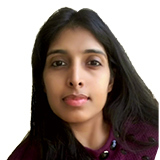 The standard code has evolved over time to minimize coding errors. There are a total of 64 codons in the genetic code arising from the permutation and combination of the 4 bases in nucleic acids. The genetic code is degenerate i.e. more than one codon can code for a single amino acid. Due to this, of the 64 codons, 61 codons code for the 20 amino acids. There are two punctuation marks in the genetic code called the START and STOP codons which signal the end of protein synthesis in all organisms. The genetic code can be read in multiple ways depending on where the reading starts. For example, if the base sequence is GGGAAACCC, reading could start from the first letter, G and there will be 3 codons - GGG, AAA, and CCC. If reading starts at G in the second position, the string will have two codons - GGA and AAC. If reading starts at the third base G, 2 codons will again result - GAA and ACC. Thus, there are 3 ways of reading the code of every strand of genetic material. 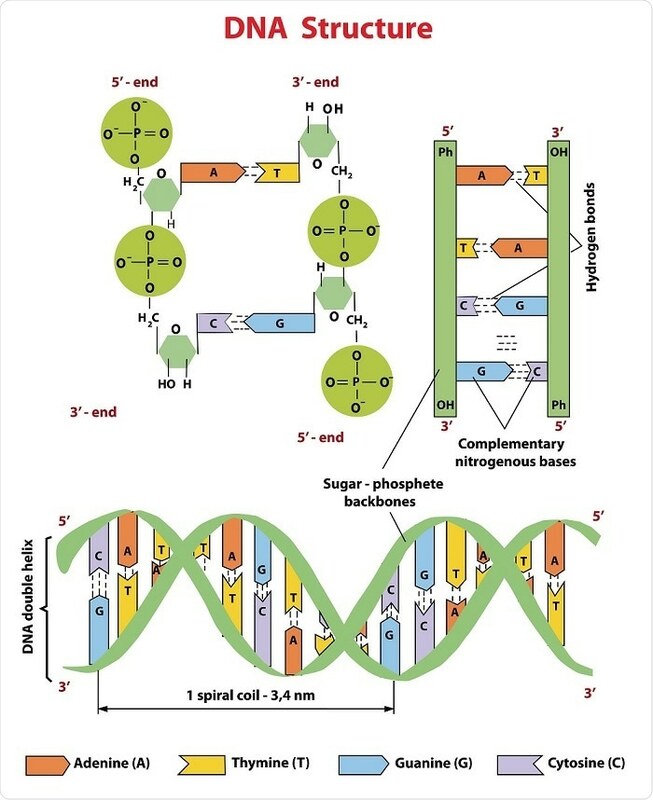 These different ways of reading a nucleotide sequence is known as a reading frame. 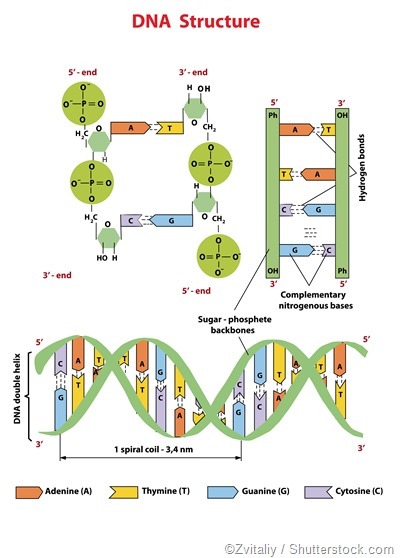 Each reading frame will produce a different sequence of amino acids and hence proteins. Thus, in double stranded DNA, there are 6 possible reading frames. The codon AUG is called the START codon as it the first codon in the transcribed mRNA that undergoes translation. AUG is the most common START codon and it codes for the amino acid methionine (Met) in eukaryotes and formyl methionine (fMet) in prokaryotes. During protein synthesis, the tRNA recognizes the START codon AUG with the help of some initiation factors and starts translation of mRNA. Some alternative START codons are found in both eukaryotes and prokaryotes. Alternate codons usually code for amino acids other than methionine, but when they act as START codons they code for Met due to the use of a separate initiator tRNA. Non-AUG START codons are rarely found in eukaryotic genomes. Apart from the usual Met codon, mammalian cells can also START translation with the amino acid leucine with the help of a leucyl-tRNA decoding the CUG codon. Mitochondrial genomes use AUA and AUU in humans and GUG and UUG in prokaryotes as alternate START codons. In prokaryotes, E. coli is found to use AUG 83%, GUG 14%, and UUG 3% as START codons. The lacA and lacI coding regions in the E coli lac operon don’t have AUG START codon and instead use UUG and GUG as initiation codons respectively. 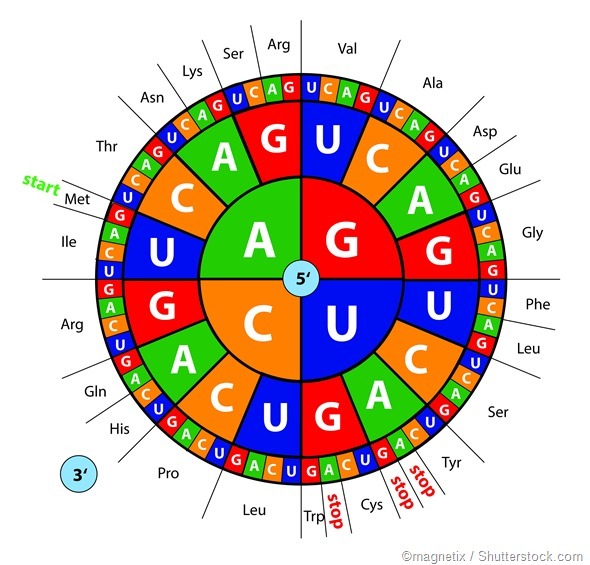 There are 3 STOP codons in the genetic code - UAG, UAA, and UGA. These codons signal the end of the polypeptide chain during translation. These codons are also known as nonsense codons or termination codons as they do not code for an amino acid. The three STOP codons have been named as amber (UAG), opal or umber (UGA) and ochre (UAA). "Amber" or UAG was discovered by Charles Steinberg and Richard Epstein and they named it amber after the German meaning of the last name of their friend Harris Bernstein. The remaining two STOP codons were then named "ochre" and "opal" so as to maintain the "color names" theme. During protein synthesis, STOP codons cause the release of the new polypeptide chain from the ribosome. This occurs because there are no tRNAs with anticodons complementary to the STOP codons.